How Big a Fireplace to Build? Pictures of Inglenook Fireplaces Our modern customers tend to want larger fireplaces than our ancestors did. Hard to tell why. 100 years ago houses were kept cooler and probably their owners wanted as efficient a fireplace as they could get since they had to chop and carry the wood. Modern homes tend to be larger and have larger open great rooms and multi purpose rooms whereas an 18th century home might have divided up that space into two or three rooms with a fireplace in each one. Large fireplaces are impressive and can heat a large space while smaller fireplaces provide a more cozy atmosphere more conducive for an evening of reading by the fire. How do you plan to use your fireplace? A 60" fireplace would sure get noticed but might be a little overwhelming unless you let the fire die down to where it's not very efficient. Maybe efficiency doesn't matter. A look at some pictures on the website might help. The cooking fireplace at http://www.rumford.com/cookfp.html is five feet wide and in a rather small kitchen about 12 feet by 15 feet with eight foot ceilings. Customer loves it. You can also make a smaller more efficient Rumford look right in a large room, or fill out a massive chimney where otherwise the fireplace might look too small, by framing it within a panel or double return. See the examples. The Victorians were masters at making small 21" wide fireplaces dominate a room by framing, returning and adding trim detail. 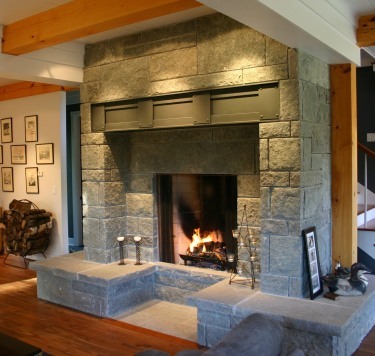 Basically, you can build a large fireplace in your room or a smaller one that you can make fill out the space with creative framing and detail. Go with your instinct if you want a large fireplace in your great room. Then build a 30" Rumford in a bedroom or library to be cozy. I had another question regarding fireplace size. I checked out your specifications page and was hoping for some advice regarding fireplace size. Our modern customers tend to want larger fireplaces than our ancestors did. Hard to tell why. 100 years ago houses were kept cooler and probably their owners wanted as efficient a fireplace as they could get since they had to chop and carry the wood. Modern homes tend to be larger and have larger open great rooms and multi purpose rooms whereas an 18th century home might have divided up that space into two or three rooms with a fireplace in each one. I'd go with your instinct and build a large fireplace in your great room. Then I'd build a 30" Rumford in a bedroom or library to be cozy.